It's July, I'm in the North Cascades for a few weeks of guiding and today is a town day, between clients coming from the east coast to climb in the amazing mountains of the Pacific Northwest. The weather's been on-and-off cloudy days with rain. In some ways it's a departure from my previous trips here, where I've experience largely good weather. Richard Vlasak, who I've climbed with around the northeast, in the North Cascades and in Alaska came to climb for a few days this summer. 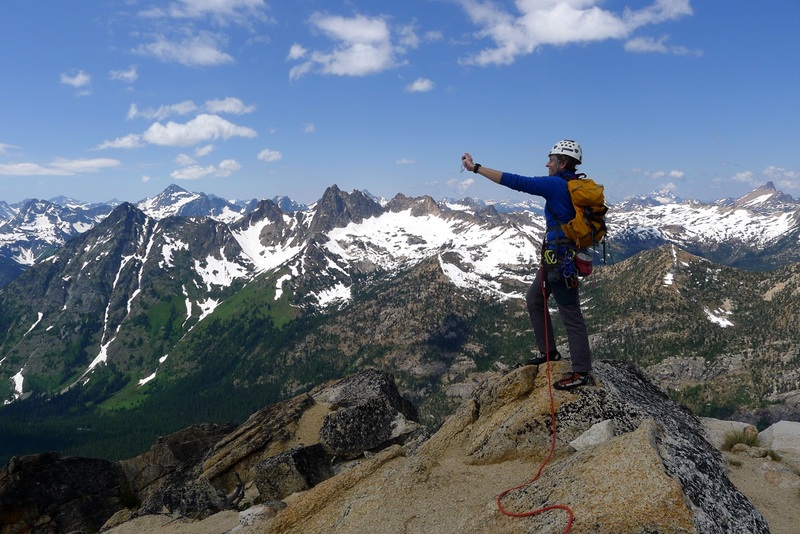 This season North Cascades Mountain Guides has been gracious enough to allow me to work as a guest guide. This gave Richard and I access to several great Washington Pass objectives that we haven't done together in the past. After a quick food shop we headed for Washington Pass and began the approach to the Liberty Bell. Our tune-up objective was the Beckey Route, a 4-pitch route on the west side of this formation. The Liberty Bell is an impressive summit. When viewed from the east it's 1500' tall obelisk of clean granite looming above the hairpin turn on Highway 20 in Washington Pass. From the west though, it looks like a smaller granite dome that would be right at home in Tuolumne Meadows or the Sierra High Country. The beautiful views and clean granite make the long walk worthwhile. After a dip in the Methow River in Mazama we packed and planned for our second objective, Paisano Pinnacle below the west face of Burgundy Spire. 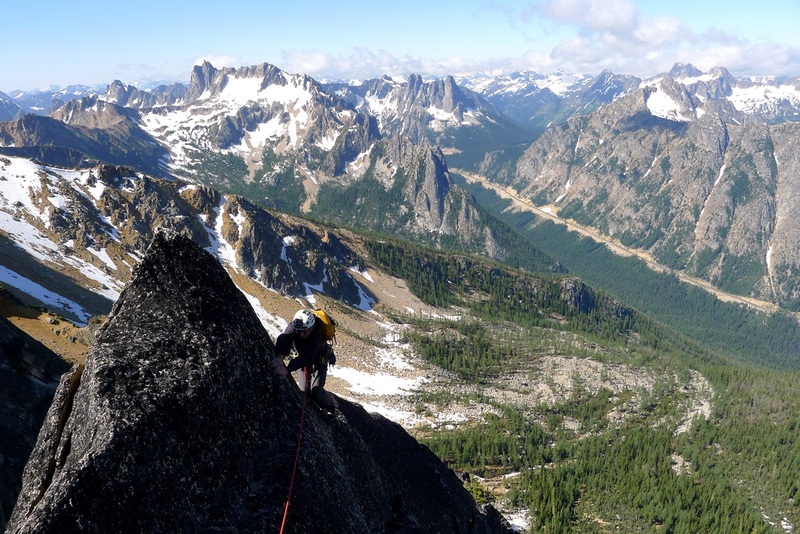 This 7-8 pitch ridge climb has outstanding rock and amazing positioning alongside the giant northwest faces of the Wine Spires. We approached the following day, camped among beautiful larch trees at 6200' and went to bed early. Our climb of Paisano Pinnacle went as planned, and by 7 the next evening we were enjoying beers and burgers in Winthrop, a small tourist town 15 miles east of Mazama. After a full rest day we decided to head into Thornton Lake and on towards Mt. Triumph. The Northeast Ridge of Mt. 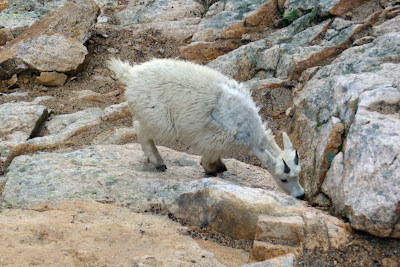 Triumph is a classic ridgeline route on a mountain that stands out, all by itself, in front of the rugged Picket Range. The approach, through dense forest, up steep hillsides and across several large creeks is arduous but never extreme. Despite a cold, soaking rain, we made good progress toward Thornton Lake, where the official trail ends and the climber's path to Triumph begins. Just above the Thornton Lake Richard slipped on a small slab of rock where the trail traverses. His fall, although short (5 feet down a low angle slab), was forceful enough to twist his left knee. After calming down, drinking, and eating a snack Richard determined that he was able to walk as long as his left foot didn't twist in an outward direction at all. A sleeping pad, cordalette, and trekking pole splint provided enough rigidity so that he could walk using the assistance of a trekking pole. 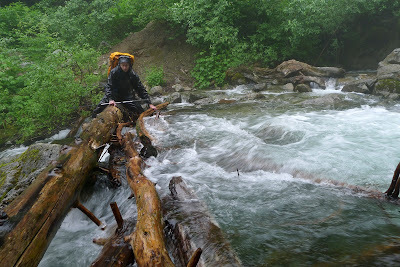 I carried both packs while he struggled just to navigate the soaking wet slabs and large tree roots on the steep, narrow trail. Richard did an amazing job dealing with the challenging trail and weather conditions as we walked back down the 2500' and 5 miles to the car. It served as a giant reminder that nearly any lower body soft tissue injury, no matter how small, can make it nearly impossible to get out of the woods. Worse yet, any type of fracture (even a hairline fracture) in this setting will most likely require a rescue. Scary. On the drive to a hotel that evening we both agreed that no day in the outdoors should be be more epic than the one we just experienced. We sunk into our beds and slept hard, grateful for the rest after a very challenging day. The following day, as we visited Anacortes and Deception Pass State Park, Richard was more-or-less able to walk normally. As climbers we tend to forget just how rugged outdoor terrain is compared to our everyday routes along sidewalks and roadways in the towns and cities where we live. The whole ordeal, which ended well serves as a wake-up call. Climbing, and everything about it can be dangerous. We try our best to minimize risks but things can and do happen. This is the truth, and to ignore this is to deny the reality of the situation. As a climber it's easy to forget about life's small victories - enjoying the morning coffee, taking a walk in the park on a beautiful day with your dog, or sharing a nice meal with loved ones. Having the ability and mobility to climb is what I might call a big victory. There are so many people out there that can't get out and climb, hike or bike because they don't have the resources or because their body won't allow them this luxury. Remember this next time you're outside, and don't forget that nearly any injury, no matter how small, can become serious in the backcountry.